As a huge fan of TinkerBell (she’s so sassy and fun) I love seeing new TinkerBell movies come out. I almost wish they would have come out with these when I was a little girl. Luckily for me I have a daughter and a son who love Tinkerbell so I have the perfect excuse to watch all things Tinkerbell. I’m not sure who’s more excited when a new Tinkerbell movie comes out, myself or the kids. It’s probably be me but I’m going to go ahead and say it’s them. The latest TinkerBell movie is TinkerBell and the Legend of the Neverbeast. An ancient myth of a fabled creature sparks the curiosity of Tinker Bell and her good friend Fawn, an animal fairy who’s not afraid to break the rules to help an animal in need. But this creature – massive and wondrous with glowing green eyes – is not welcome in Pixie Hollow – and the scout fairies are determined to capture the mysterious beast, who they fear will destroy their home. Fawn, who sees a tender heart beneath his gruff exterior, must convince Tink and her fairy friends to risk everything to rescue the NeverBeast. As I mentioned we were excited when this movie arrived so we watched it right away. I love how this movie helps me bring up the topic of judging someone or something just by the way it looks. It’s so easy to bring the topic up as we watch the movie together. Another thing I loved about it was that it was a huge hit with both Mason and Kyla. Any movie that keeps both of the interested is a movie that I love! Turn movie night into something even more fun with these crafts and activities related to Tinkerbell and the legend of the Neverbeast. 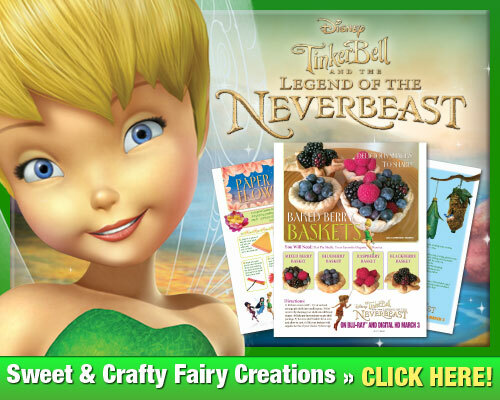 You can purchase TinkerBell and the Legend of the Neverbeast at your local store or on Amazon.com. Peter Pan 60th Anniversary Diamond Edition 3 Disc Combo IN STORES NOW!